The name originally belonged to a fabric and novelty shop at nearby 23 Rue de Buci. The shop sold silk lingerie and took its name from a popular play of the moment (1800s) entitled Les Deux Magots de la Chine. Its two statues represent Chinese “mandarins,” or “magicians” (and “alchemists,” depending upon one’s philosophical point of view), who gaze serenely over the room. These two oriental gentlemen are the source of the name for one of the great cultural landmark cafes of Saint-Germain des Pres. “Magot” literally means, “stocky figurine from the Far East.” In 1873 the business transferred to its current location in the Place Saint-Germain-des-Prés. In 1884 the business changed to a café and liquoriste, keeping the name. Auguste Boulay bought the business in 1914, when it was on the brink of bankruptcy, for 400,000 francs (anciens). The present manager, Catherine Mathivat, is his great-great-granddaughter. It was frequented by famed artists such as Elsa Triolet, Louis Aragon, Hemingway and Andre Breton. 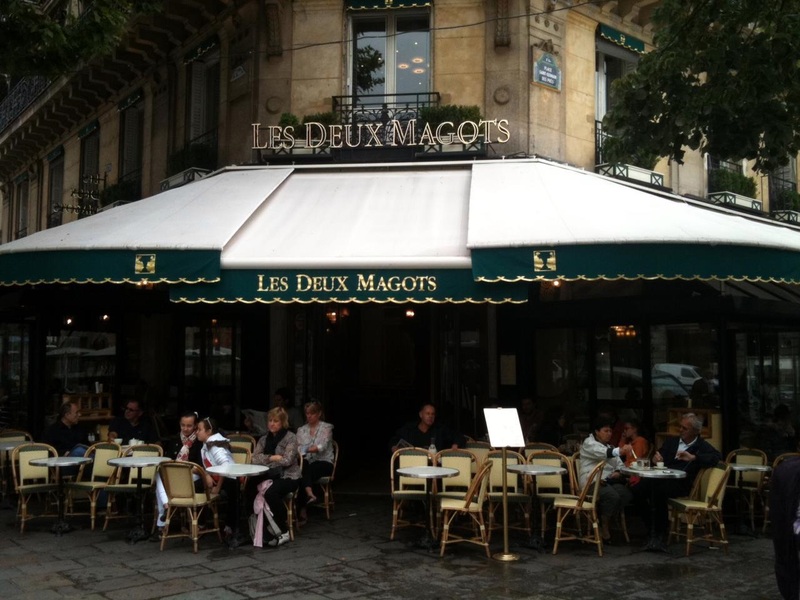 Les Deux Magots is one of Paris’ most famous (and most touristy) cafés, but it’s a fun scene to sit and have a coffee out front if the weather’s good. Located in the formerly artsy and now trendy and espensive Saint-Germain-des-Prés area, Les Deux Magots is mostly famous for its prestigious clientele over the years, including Ernest Hemingway, Jean-Paul Sartre, Pablo Picasso, Albert Camus; the list goes on and on It’s a great feeling to sit enjoying a coffee and think about the brilliant folks who used to used to do the same thing in the same place. A Marais institution, the Little Horseshoe is a pocket-size cafe-bar with an original horseshoe-shaped zinc bar from 1903. The place overflows with regulars from dawn to dark. Great apéro spot and great WC – stainless-steel toilet stalls straight out of a Flash Gordon film (actually inspired by the interior of the Nautilus submarine in Jules Verne’s 20,000 Leagues under the Sea ). Au Petit Fer A Cheval means “little horseshoe” in French. The inside bar is shaped like a horseshoe. The place is petit. I passed it a few times without even realizing it. But this is one of the reasons why it has so much character. If you can find a seat at the bar you can eat or drink. They serve a reasonably priced menu and serve coffee and wine. There is seating outside but its limited. If you get the chance there is also a few tables to sit and dine behind the bar. If you are walking through the Marais I highly recommend it. The name of Au Petit Fer Cheval is very appropriate. It is small, very small. The tiny entrance, bordered by few tiny pavement tables, leads into a very tight bar area, bringing people and waiters together and forcing conversation. Past the bar is a dining area where the tables are so close that you will hear your neighbour breathing and possibly what they are thinking. You can have lunch and dinner throughout the day from Noon to 1.00 am. We arrived about 2.00pm and managed to get a table. It seemed impolite in such a tight crowd to take photos of our meals. We chose the blackboard specials of veal (€12) and fish (€18) and a small carafe of wine (€12). All meals are served from a small servery that also doubles as the door to the kitchen. The chef, Pierre Beco, is also known for his duck confit and Aubrac beef sirloin served with fried potatoes and green vegetables. Tarte Tatin with fresh cream is also a speciality of the house. The service was prompt, professional and friendly. All in all, a lovely atmosphere, good food and classic Parisian vibe. Be sure to check out the stainless-steel toilets inspired by the interior of the Nautilus submarine in Jules Verne’s 20,000 Leagues under the Sea. 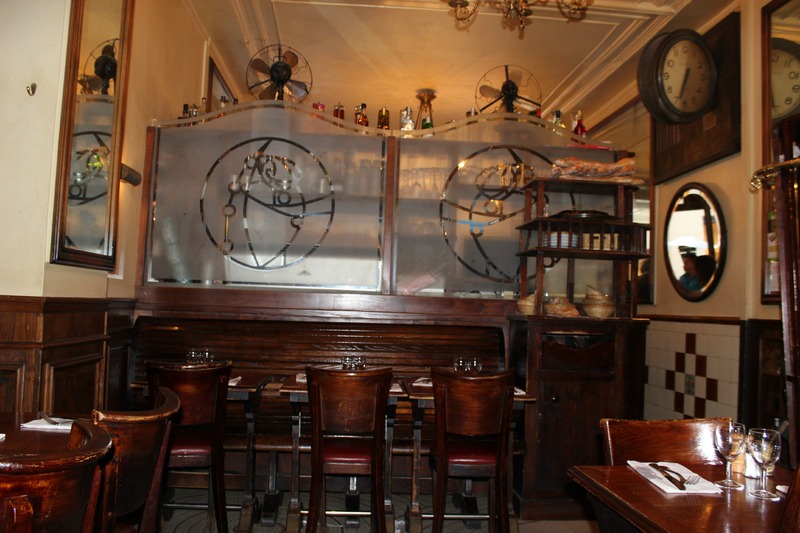 If you’re looking for authenticity, you won’t get much closer to Paris than Au Petit Fer à Cheval. If you can get a seat outside, you’ll have a prime view as Marais is all about people-watching. Open for over a century, the early horseshoe was bought in 1990 by Xavier Denamur. With its latest dining room hidden counter-shaped horseshoe and its terrace overlooking the comings and goings of one of the most exclusive streets of the capital, this tiny bistro has quickly acquired an excellent reputation. 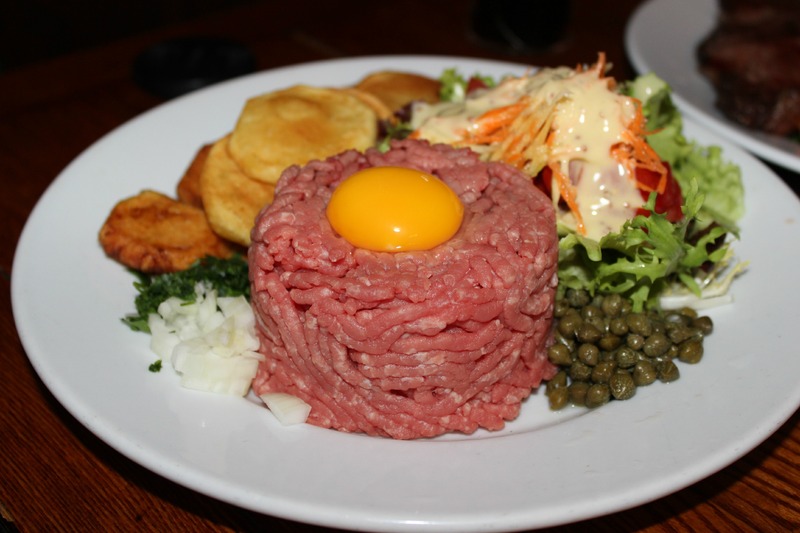 The simple and authentic cuisine of chef Pierre Beco, the particularly warm friendliness of the place and all stainless steel toilets participated in the sit lasting notoriety of the former Café Bar Brazil. Hours: 9.00am to 2.00am (every day); kitchen open from Noon to 1.15am. This cafe in the busy market street of Rue Montorgueil seems to be busy from morning to dark. 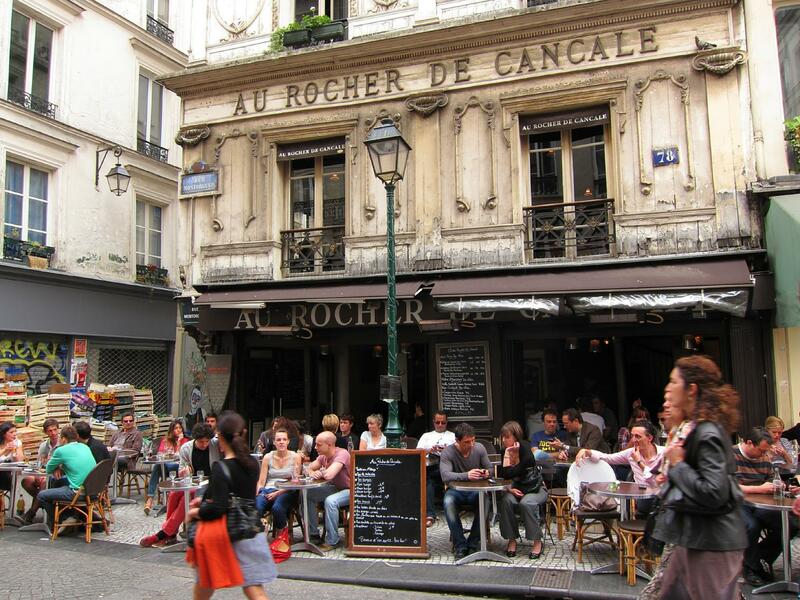 Its rich history and sheer location in one of the most interesting streets in Paris makes the wait for a table worthwhile. A crowded street, loud voices of the fruit vendors, tourists and well heeled Parisians fill this space with an amazing almost palpable energy. Sitting watching the many different folk pass by, there is a real sense of history. The cafe was a favourite of Novelist Honoré de Balzac and again it is such a luxury to feel like you are sitting where these now famous people once also sipped coffee. Open since the mid 19th Century, if you can take a moment to enjoy the ambiance of this cafe will be most grateful. 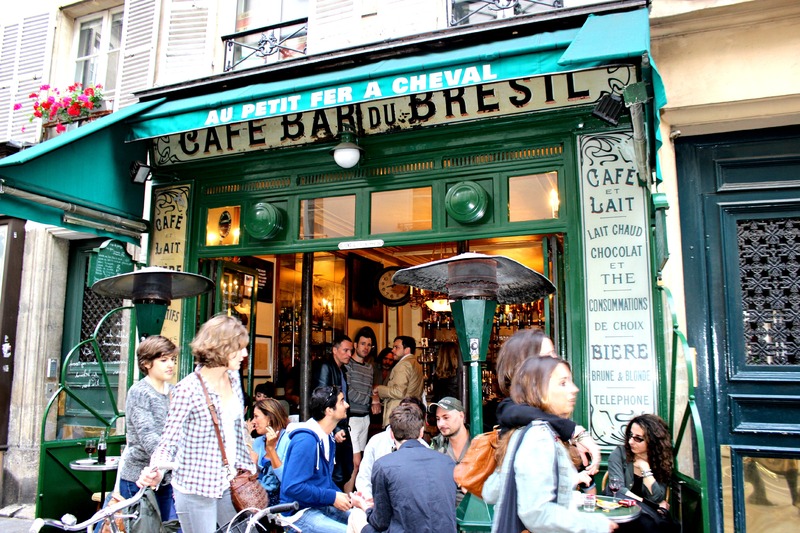 Got a favourite cafe in Paris?